Can I transfer credits into BSL programs? For our BBA programs, it is possible to transfer up to 100 ECTS credits or 60 US credits (from recognized institutions of undergraduate education). Credits are not transferable for any other program. How is it possible to complete a BBA in two years at BSL? The BSL BBA 2-year program is equivalent to a three-year 200 ECTS bachelor program, accredited by ACBSP. In Europe, university programs are measured in terms of workload hours, which is a combination of class hours and study hours. The BSL program accelerates a typical three-year bachelor program into an intense two-year program by increasing the number of classes provided over the two-year period and by adding two 10 week summer terms.The credit hours given by BSL differ slightly to both the traditional US systems of semester hours and quarter hours. During a calendar year, BSL gives four, ten-week terms, allowing students to earn 15 hours of credit per term. A student with a full load takes five, three credit-hour courses, with four contact hours per week per course, and thus spends a total of 20 hours per week in the classroom. By maintaining this rigorous schedule students can complete the 120 US credits required for the BBA in a minimum of eight terms or two calendar years. Are there any specializations offered in the BBA program? Our BBA program offers the possibility to complete your final, third year at Dublin Business School where you can orient your studies towards preferred subjects by choosing from streams of Management, HRM, Law, Psychology or Project Management. How difficult is it to study at BSL? To study towards any degree at BSL is not easy, but it is a worth-while experience that will offer enriching learning experiences. Such experiences only exist where every student gives his or her very best effort, and is willing to work hard to achieve good results. What are the requirements to be accepted at BSL? Please check the admissions criteria for the BBA program.Besides the administrative papers and letters, you need to show that you are not only interested in management and industry, but that you have an interest in the long-term development and sustainability of the businesses or the organizations you are hoping one day to work in. You need to do at least two things to show that you have these interests: write a motivation letter and attend the interview (by Skype or in person).First, you must describe in your motivation letter what kind of industry or career you are interested in and why (it can be anything you wish, such as business, fine arts, charities, government, nature, sports, etc.). Also in the motivation letter, you need to explain what you think the skills are that you want to learn in order to become qualified for the industry that interests you.Second, at the interview, you will be asked to evaluate to what extent you really want to study at BSL. This may surprise you ! It is not simply the school that decides if it will accept you, but you must also decide if you accept the school. This means that you must first explore what BSL does. BSL is not just a school to get a degree. BSL is a place where you can enrich your learning experience. So, prepare for the interview by checking on-line about everything you can find about the school. In order to study at BSL, you will be expected to make a commitment to working hard, and studying and behaving like a professional. How many IB points do I need to be accepted for the BBA program? The minimum IB score is 32. If an applicant has not achieved the required minimum, but can show that she/he has other qualities, such as hard-working, strong interests in sustainable business and management, then admission may be granted with performance conditions. This means that the candidate will have to make extra efforts in the first school terms at BSL in order to show that you are serious about working hard. Can a Swiss student without the Maturité / Maturitätszeugnis apply for the BBA? Yes, students who have not completed the Swiss Maturity diploma, but who have either started or completed an apprenticeship (Swiss Professional Maturity in commerce also called u201cBerufsmaturau201d or u201cMaturitu00e9 professionnelleu201d) can apply for the Bachelor at BSL. At least three years of work experience will compensate for the lack of a Maturity diploma, but the more years of work experience you have, the lower the performance conditions for your studies at BSL will be. As part of the selection process, successful applicants are interviewed to assess their level of English and their chances of success in the particular program. As a guide, you will need a level of English as follows: IELTS 6; TOEFL 80; TOEIC 750 (one test only required)The BSL TOEFL code is 0018. BSL offers partial scholarships of up to 50% off the tuition fee to worthy candidates on a need and merit base. Applicants are reviewed on an individual basis and are judged according to their academic achievements, personal motivation, and the general positivity that they can add to the school. Merit-based scholarships are then available to high-preforming students for the second part of the program. Does the BBA program include an internship? Internships at BSL are optional. If students are interested in doing an internship, we have a dedicated Student Counselor at BSL who will help you, the student, meet with industries or companies that interest you. However, we do not promise or guarantee an internship, but we help you in your in making your contacts. Yes, at BSL, a staff member is at the school especially to support students in their career orientation. BSL cannot u201cgiveu201d a job to students or graduates from BSL, but the schoolu2019s staff members do help all students in developing their career interests and contacts (professional networking). 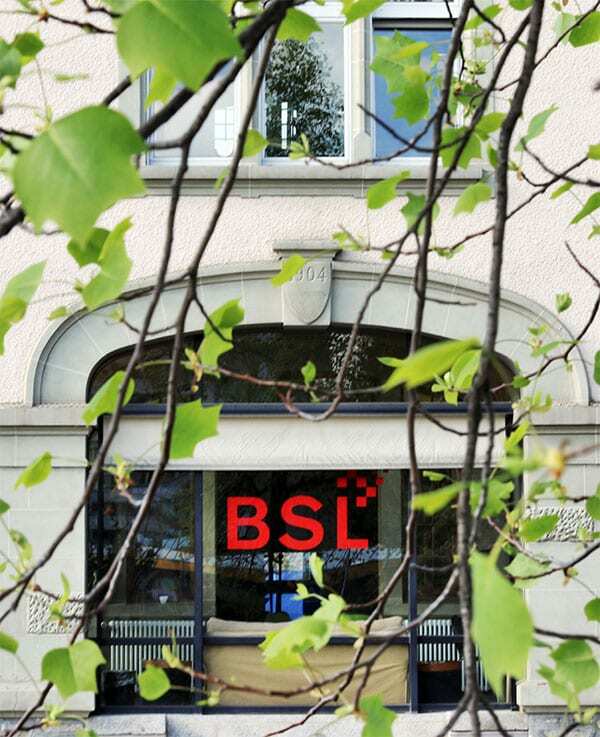 Also, it is important to note that BSL is in Western Switzerland, and that this region of the country is unique in the world because it is home to an extremely high density of multi-national companies, international businesses, international financial services, international organizations, NGOs, professional associations, as well as humanitarian and charity organisations. All of these attract numerous small and large suppliers, consultants and commercial agents who all have interests in these larger organizations and multinational corporations as stakeholders or as partners. Studying in Western Switzerland is therefore a smart decision if you also want to develop your professional network. BSL staff work hard with industry leaders and professors to continuously develop all these contacts so students can benefit from them. What kind of job will I get with a Bacheloru2019s degree? What is the meaning of u2018accreditationu2019? Institutional and program accreditations ensure that a school and its programs offer a high quality level of education. Only 10% of business schools are accredited (have undergone the rigorous accreditation process). BSL was the first business school in Europe to achieve full ACBSP accreditation for all of its programs in 1996. Institutional accreditations such as AACSP and EQUIS validate the viability of a school, whereas, program accreditations, such as AMBA (only for MBA programs) and ACBSP (for all business programs including the doctorate level) validate the continuous high quality of the programs delivered. For more information on BSLu2019s accreditation, seeu00a0Rankings and Accreditation. The ACBSP accreditation ensures that BSL degrees are recognized and valued worldu2010wide.With the launch of the Bologna reform in Europe, universities rely increasingly on theu00a0ENIC-NARICu00a0system to verify degrees of other universities. Currently, BSL is listed in the U.S. NARIC system through CHEA (Council of Higher Education Accreditation), thus providing recognition of its degrees to European universities where our students may want to continue their education. CHEA is among the three official bodies in the United States that are entitled to list accredited institutions of higher education. See more information atu00a0Rankings and Accreditation. The Swiss ENIC system currently lists only Swiss stateu2010owned universities and cannot list private institutions such as IMD or BSL.Please note that both IMD and BSL are listed in theu00a0U.S. NARIC system. BSL is listed in the U.S. NARIC system through CHEA providing the recognition of its degrees to any admission officer of universities across Europe where our students may want to study. In the United States, three bodies are officially entitled to list accredited institutions of higher learning, among them CHEA (Council of Higher Education Accreditation).The Bologna reform regulates university collaborations across Europe with a unified ECTS credit transfer system.u00a0 It has placed new demands on the ENICu2010NARIC system as university Admission Officers can face difficulty in correctly evaluating the pertinence of various degrees in student application files. An example: current limitations of the system include that private institutions in Switzerland are not considered by ENIC Switzerland (part of the Swiss Rectorsu2019 Conference of Swiss Universities (CRUS), a stateu2010managed institution.Top tier private institutions such as IMD and BSL are as a result not included in the European / Swiss ENIC table of recognized universities with the result that some Swiss state universities do not recognize BSL degrees.u00a0 However, BSLu2019s diplomas are included in the U.S. NARIC list, and this ensures recognition of BSL degrees within the largeru00a0ENIC-NARIC networku00a0by all universities and governments that also recognize degrees from American universities (all universities in English-speaking countries, all universities that recognize American degrees from international universities anywhere in the world). BSL advises students to budget a minimumu00a0of CHF 2500u00a0per month for expenses related to food, accommodation, local travel/commuting, school textbooks, social/entertainment, and medical insurance.Estimated costs u2013 please note these areu00a0estimationsu00a0of monthly costs which vary depending on the studentu2019s budget and lifestyle:Monthly accommodation estimate: CHF 1000 u2013 CHF 2,500Monthly food expenses estimate: CHF 600 u2013 CHF 800Monthly travel expenses estimate:u00a0 CHF 100 u2013 CHF 250Monthly medical insurance estimate: CHF 300 u2013 CHF 500Please note that every student in Switzerland must be insured by a medical and accident insurance company in Switzerland, even if you already have an international travel insurance.u00a0 (BSL can help you find an insurance company if you do not already have insurance in Switzerland).